Police put the driver of a Spanish train under investigation after at least 80 people died when the train hit a sharp bend at high speed, derailed and caught fire near the pilgrimage centre of Santiago de Compostela, in one of Europe's worst rail disasters. Rescue workers pull victims from a train crash near Santiago de Compostela in northwestern Spain. 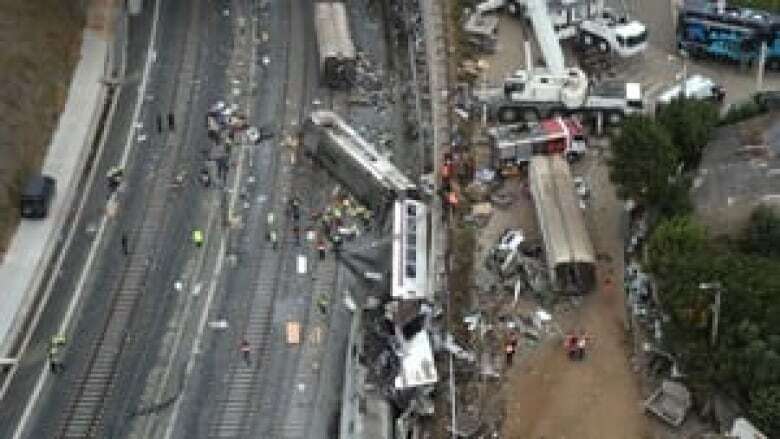 Police put the driver of a Spanish train under investigation on Thursday after at least 80 people died when the train hit a sharp bend at high speed, derailed and caught fire near the pilgrimage centre of Santiago de Compostela, in one of Europe's worst rail disasters. The crash was caused by excessive speed, an official source with knowledge of the accident investigation told Reuters. However, results of multiple investigations into possible failings by either the driver or the train's built-in speed regulation systems are not yet in. One local official described the aftermath of the crash, on the eve of one of Europe's biggest Christian festivals in the ancient city, as like a scene from hell, with bodies strewn next to the tracks. An Associated Press estimate of the train's speed at the moment of impact, using the frame rate of the video and the estimated distance between two pylons gives a speed range of 144-192 km/h. Another estimate calculated on the basis of the typical distance between railroad ties gives a range of 156-182 km/h. A spokesperson for Galicia's Supreme Court told Reuters that one of the train's drivers, who was hospitalized with unspecified injuries, was being questioned by police as a possible suspect. Another investigation into possible faults in safety equipment is also underway. It was not immediately clear which of the train's two drivers was under investigation. But Renfe, the state-owned company operating the train, identified him Thursday as Francisco Jose Garzon Amo, a 30-year employee of the state rail company. He was described as being a fully qualified driver. The train was built by Canadian company Bombardier and Spain-based Talgo and was around five years old. It had almost the maximum number of passengers. El Pais newspaper said one of the drivers radioed the station in the moments after the crash that the train entered the bend at 190 km/h. An official source said the speed limit on that stretch of twin track, laid in 2011, was 80 km/h. "We're only human! We're only human!" the driver told the station, the newspaper said, citing sources close to the investigation. "I hope there are no dead, because this will fall on my conscience." Investigators were trying to urgently establish why the train was going so fast and why failsafe security devices to keep speed within permitted limits had not worked. Cranes were still pulling out mangled debris on Thursday morning, 12 hours after the crash. Emergency workers had stopped their search for survivors, the court spokeswoman said. In total, 178 people were taken to hospital after the crash, a regional government spokeswoman said. Of those, 94 were still being treated, of which 31 including four children, were in serious condition, she said. U.S. citizens were amongst the injured, the U.S. Embassy said in a statement and at least one British citizen was wounded, the British embassy spokesman said. 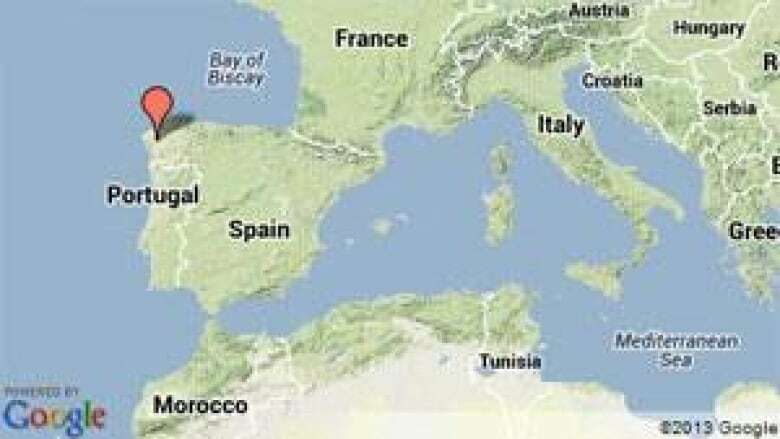 Several other nationalities were believed to be among the passengers. The U.S. State Department confirmed that one American was killed in the crash and five others were injured but, spokesperson Marie Harf said those numbers were "likely to change." "Today the American people grieve with our Spanish friends, who are in our thoughts and prayers," U.S. President Barack Obama said in a statement. Foreign Affairs Minister John Baird and Lynne Yelich, a minister of state, issued condolences on behalf of Canada on Thursday. "We would also like to wish a speedy recovery to those injured in this tragic event," the statement read. Canadian citizens in Spain requiring emergency consular assistance can contact the Canadian embassy in Madrid at +34 91 382 8400 or call Foreign Affairs, Trade and Development Canada's Emergency Watch and Response Centre collect at 613-996-8885. Spain's Prime Minister, Mariano Rajoy, who was born in Santiago de Compostela, the capital of Galicia region, visited the site and the main hospital on Thursday. He declared three days of official national mourning for the victims of the disaster. Passenger Ricardo Montesco told Cadena Ser radio station the train approached the curve at high speed, twisted and wagons piled up one on top of the other. "A lot of people were squashed on the bottom. We tried to squeeze out of the bottom of the wagons to get out and we realized the train was burning.... I was in the second wagon and there was fire.... I saw corpses," he said. Spain's rail safety record is better than the European average, ranking 18th out of 27 countries in terms of railway deaths per kilometres travelled, the European Railway Agency said. 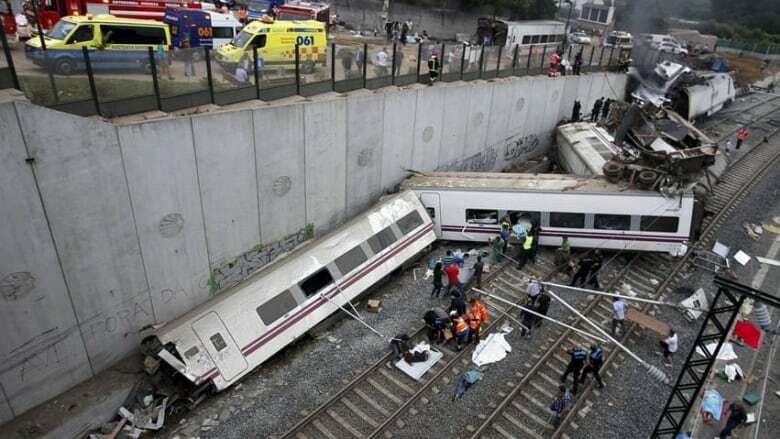 There were 218 train accidents in Spain between 2008-2011, well below the European Union average of 426 for the same period, the agency said.